Shaheed Bhagat Singh Nagar, Ludhiana, India- 141006. 2. The students I taught at my short tenures of Schools at Ludhiana (Ryan International and Guru Gobind Singh Public School), still remember me for the experience they have. 3. I took special care to sharp the edge of my students. 4. Small class and personal care. 5. Regular Tests and reporting to Parents. 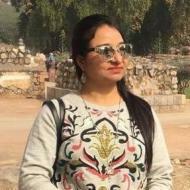 Inderpreet K. describes herself as 2 Teach is 2 Touch Lives FOREVER. She conducts classes in Class 10 Tuition. Inderpreet is located in Shaheed Bhagat Singh Nagar, Ludhiana. Inderpreet takes Regular Classes- at her Home. She has 20 years of teaching experience . Inderpreet has completed Bachelor of Education (B.Ed.) from Punjabi University Patiala in 1993. She is well versed in Punjabi, English and Hindi. Send Enquiry to Inderpreet K.